In fact, Edison Research in 2018 found that over 43 million people in the US have a smart speaker. Say whaaaaat?! Their research also found that the longer people have owned a smart speaker, the more they listen to it, and they confidently predict that smart speakers are likely to become the dominant audio player. Smart speaker media consumption is resulting in diminishing use of other media e.g. radio, TV and even reading magazines and newspapers. Fascinating. People use smart speakers to listen to music, make calls, get traffic and weather updates, listening to podcasts, order food and groceries, controlling household devices and so much more. Did you know that listeners can subscribe to a flash briefing? Flash briefings are short, informative pieces of pre-recorded audio that last up to 10 minutes long. They are like a podcast or radio show but you subscribe to the briefings you want to listen to. Now here’s the interesting part, did you know that you can create your own flash briefing skill to supply short bursts of content to your audience via their Alexa-enabled device (or whichever smart speaker they use)? AND, if you have a podcast then you’re half way there, you can potentially repurpose your podcast into a flash briefing. I was curious to find out more about how Alexa flash briefings work, how they can market and grow a business and how you can repurpose a podcast episode into a flash briefing. So, I got in touch with Sigrun, who is an expert when it comes to sharing her message and has been very forward thinking in getting in on Alexa flash briefings as an early adopter! Sigrun and I have met many times in person including at the Podcast Movement in Philadelphia. We also met at the Social Media Marketing World in San Diego and the Youpreneur Summit in London. Safe to say we have the same taste in events! Sigrun is a mastermind business coach, a lifestyle entrepreneur, business strategist and international speaker. She has had various CEO positions throughout her career. But, her dream was to be location independent. She wanted to live in two countries, travel the world, and take care of her health. In 2014, she started her online business and four years later, she’s built it into a seven-figure lifestyle business. She now coaches women how to do the same. 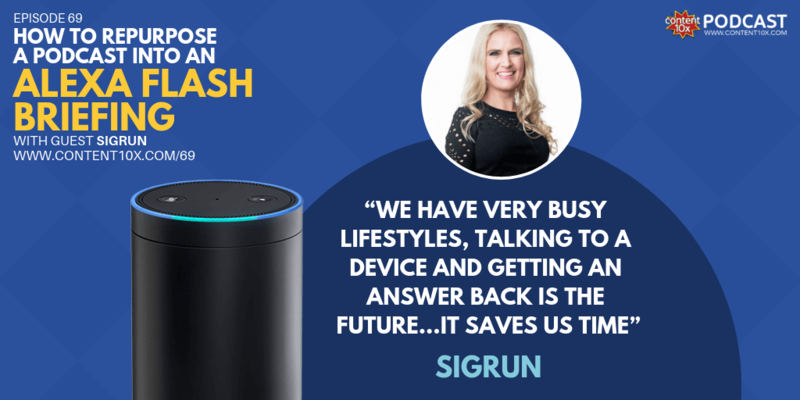 I was interested in talking to Sigrun about SO many things, but I settled finding out more about how she leverages her content and repurposes it into flash briefings for smart speakers. Something I have not covered before on the podcast and blog. Podcast Launch: 100 Podcast Episodes in 100 Days, Is it Possible? Sigrun's idea for her podcast came about long before she ever picked up a microphone. She pitched the idea to her business coach at the time. Surprisingly, her coach discouraged her from doing it, and so, her doubts grew. Yet, she couldn’t get the idea of starting her own podcast out of her mind. Once the seed of the idea was planted, it kept growing until she had no choice but to face it head-on! She knew that podcasting is a long-term strategy. There’s no such thing as overnight success. You’ve got to try it for a year and see if you benefit from it. It’s only when you’re willing to put the work in that you’ll reap the benefits. Mark Schaefer recorded 200 YouTube videos in 200 days. Although none of the videos went viral, it got his business off the ground. Hearing his story was a light bulb moment for Sigrun, who then decided to do 100 podcast episodes in 100 days! Sigrun launched her podcast in August 2017. When she began podcasting and putting more effort into other streams of her business such as Facebook marketing, her income tripled. After recording and publishing 100 episodes in 100 days, Sigrun had an audience. Following the 100 day challenge, she committed herself to release three episodes per week. For some of us, that may seem like a lot. But, it came easy for Sigrun, who is a natural born storyteller. Sigrun explained that one of the most significant benefits that her podcast has had on her career is all the networking opportunities it has presented her with. By attending podcasting events, you can easily meet so many people that you could potentially invite as a guest on your show. Just look at how Sigrun and I met! We crossed each other’s paths at a few different events and now, here she is on my podcast and I’m soon to be on hers! 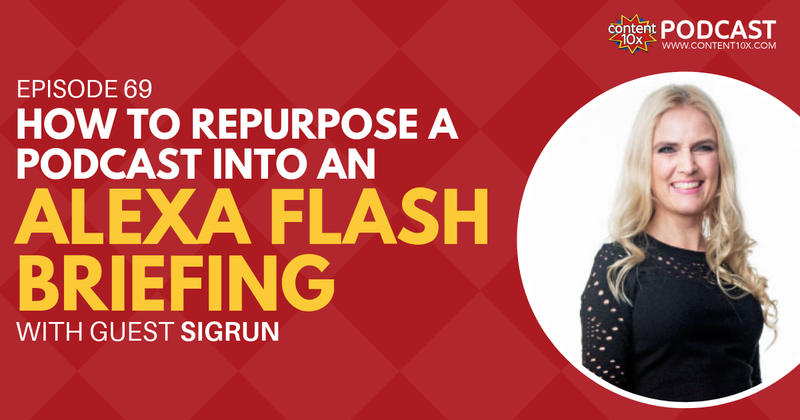 Repurposing content into an Alexa flash briefing is not as difficult as it may sound, and it can be super powerful. For many people, flash briefings are an integral part of their daily routine – and if they aren’t now, the stats show they likely will be at some point. So, if you can inject a snippet of your content into their routine in the form of a flash briefing, it gives you the opportunity to connect with your audience in a new, more personal way. 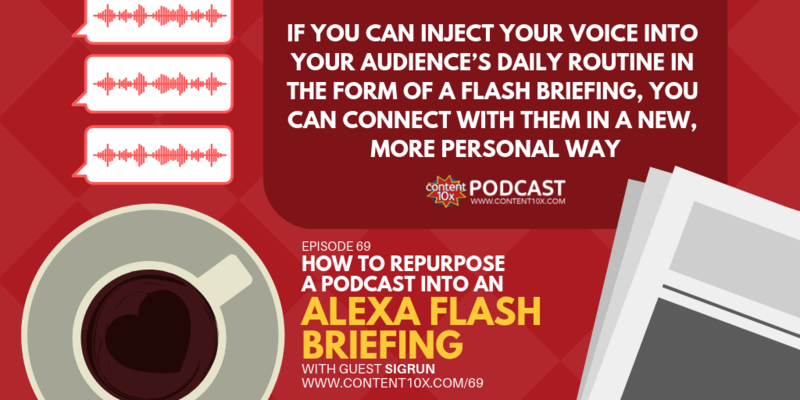 Signrun talked about how she has repurposed her podcast content into a flash briefings. A podcast host so that you have an RSS feed – not all podcast hosts support Amazon Alexa so you will need to check this (Libsyn support this). Some hosts are specifically for Alexa e.g. Sound Up Now. The important thing to remember when creating a flash briefing for Alexa is that each episode has an expiration date. It’s valid for one day only. You’ve also got to keep it short. Sigrun tries to keep her flash briefings under 90 seconds long, but you have up to 10 minutes. You need to decide the frequency e.g. daily, multiples, times a day, a few times a week, weekly. You’ll need a small square icon for your briefing and have your description ready. The good news is that you don’t always have to start from scratch. If you have a podcast you can consider taking sections from your podcast episode and transform it into a flash briefing for Alexa. If you repurpose your original episodes into transcripts, you could use that as a guideline which is what Sigrun does - she creates a short 60 or 90-second script for her briefing from her podcast transcripts. Sigrun uses a piece of music at the beginning and end of her briefings that are perfectly in-line with her brand. Including recognizable music in your flash briefings helps to build brand awareness. When people listen to it, they’ll immediately think of your flash briefing, you and your business. If you don’t have a podcast there are still repurposing opportunities. For example, do you have plenty of blog posts that you could use as the basis for your flash briefings. Old or new. Similarly, video content could be used as the inspiration for flash briefings. You could take videos, transcribe them, and use them to create flash briefing scripts. Now that you’ve taken the time to create flash briefings that you know your audience will love, it's time to think about how can you get them to add you to their daily briefings? Sigrun suggests announcing the news via social media. She did a Facebook Live episode and emailed her entire list to let them know about her new adventure into Alexa flash briefings. She even gave them a list of instructions that explained where to find them and how to add them to their daily rundown. Don’t assume people will know how to do this, make it easy for them. Sigrun experienced nothing but positive feedback about being on Alexa, which motivated her to continue. Both Siri and Google Home have a similar flash briefing service (Sigrun is on them all). But, Alexa is still the most popular of the three and is a great place to start. After speaking to Sigrun, I’m starting to think about how Alexa flash briefings might be useful in growing not only my own business but my client’s too! One thing is for sure, they are here to stay! What about you? Do you own an Alexa enabled device? If so, what are your favorite morning flash briefings, and do you think you’ll ever create your own Alexa flash briefings? Please comment below.